In Cape Town, holiday apartments don’t get better than those on the Atlantic Seaboard. When you rent a lock-up-and-go in one of the area’s 3 premier neighbourhoods, you join an exclusive group of people dedicated to exclusive living. 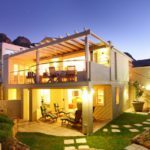 If you’re looking for a short term apartment rental in Cape Town, these 2 bedroom holiday homes have everything you could need, for your business trip, romantic getaway or overnight stay. With plenty of space and comfort, discerning tourists like you will enjoy a happy place to stay that minimizes stress and maximizes luxury in some of the world’s leading penthouse rentals. Bakoven is a small, exclusive residential area with a sheltered beach. 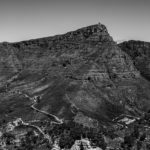 It’s also surrounded by some of the most beautiful views in Cape Town. Holiday apartments here are designed to amplify the impact of the vistas from every conceivable angle. Because of Bakoven’s secluded location, it’s an area popular with international celebrities looking to travel in private. You never know who you might spot in one of the area’s select two-bedroom apartments! Slip on a pair of shades, and you’ll fit right in. The peaceful Bakoven area is the perfect place to start your search for a short term apartment rental in Cape Town. Make yourself at home and soak up your new five-star surroundings. 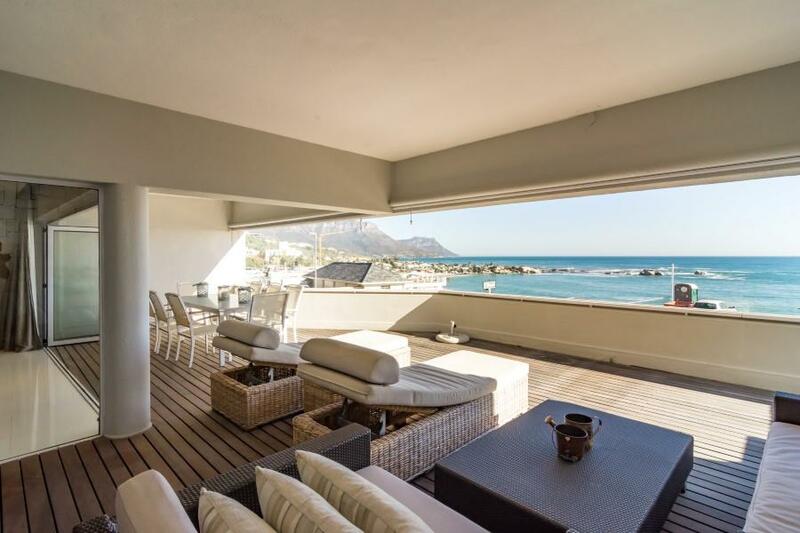 Our Bakoven rental pick: If you’re wondering “Where can I rent short-term Cape Town holiday apartments?” Bakoven’s exciting ‘Views Penthouse 1’ is among the area’s most prestigious locations. Views Penthouse 1 is a sleek, contemporary apartment with space for 4 style-conscious guests. 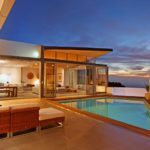 Here you can enjoy 270° ocean and mountain views, while lounging in the airy interior or splashing in the private swimming pool, high above the sea line. The penthouse has monitored electronic security and an electronic safe, so you don’t have to worry about your valuables going missing. When you’re exploring Bakoven, you’ll find hidden gems like Baked Bistro, an upmarket spot for enjoying coffee and fresh-baked treats just moments from your penthouse perch. Around the corner from Bakoven, there’s Fresnaye, which has a reputation for Cape Town holiday apartments that make jaws drop in this wealthy neighbourhood. Join the elite few who get to call Fresnaye their holiday home. 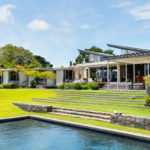 According to BusinessTech, Fresnaye has some of South Africa’s most expensive streets, as well as some of the country’s most costly “trophy homes”. Our favourite Fresnaye rental: Atico Penthouse is a dual level apartment with 2 double bedrooms. It accommodates 4 guests, and has a more intimate mood than other penthouses in the area. The star feature of Atico Penthouse is the private roof deck. The braai facilities are stylish and easy to use, and they lead onto an enviable dining space across from a 6 seat Jacuzzi. Enjoy it all surrounded by 360° views of the Atlantic Seaboard. Could you get any higher? 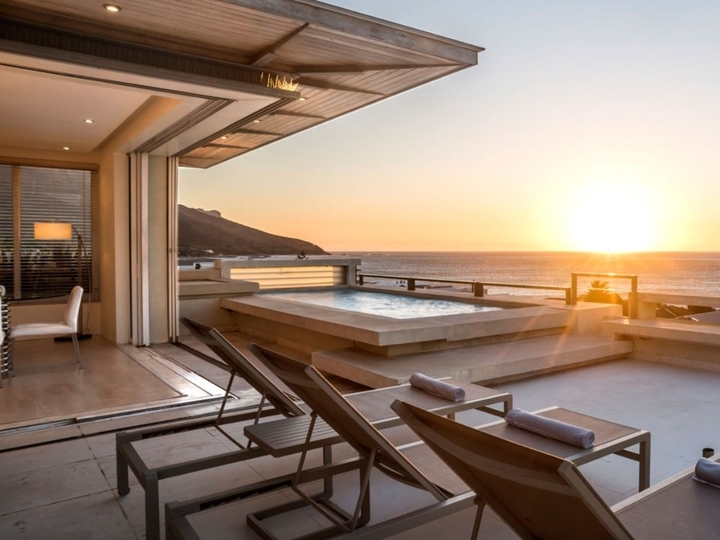 It’s this sort of superior luxury that puts Atico Penthouse above other Cape Town holiday apartments in the area, and makes it a first rate celebrity rental. The Atico apartment has 24 hour security and concierge services, to make your vacation experience that much safer and carefree. 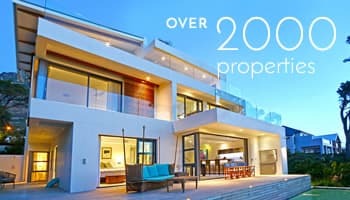 Less than 10 minutes’ drive from Fresnaye is Clifton, another prize location in Cape Town. Holiday apartments in this neighbourhood are coveted by tourists from across the globe. Clifton’s 4th beach is the preferred spot where super yachts drop anchor, especially during the picturesque summer sunsets. It’s also the beach with Blue Flag status, meaning it meets world-class standards of cleanliness and safety. Stay in a Clifton apartment, and this stunning beach will be right on your doorstep. An incomparable Clifton villa: Clifton Wave is a minimalist 2 bedroom apartment that accommodates 4. This is one of our Platinum-rated Cape Town holiday apartments, making it a haven for guests with first-class taste. 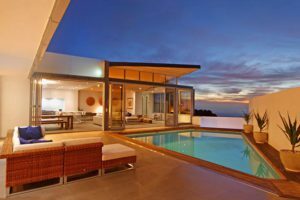 In this vacation home you will enjoy an evening of light entertaining, as the waves roll in on the beach below. Clifton Wave also has a sun deck and outdoor dining area, with a view of the ocean and the Twelve Apostles mountain range. These penthouses are some of the crown jewels of Cape Town. Each one gives you the opportunity to experience VIP apartment living in the Mother City. Whether you prefer a cosy, easy penthouse environment or decks that are larger than most houses, there is an apartment for you high above the city. 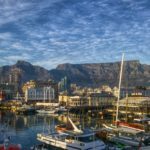 If these Cape Town holiday apartments have captured your imagination, there are plenty more to choose from. You’ll find a selection of self catering rentals in Clifton here.